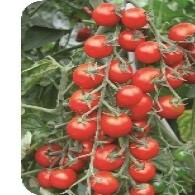 Red mini round-shaped indeterminate tomato hybrid with average fruit size of 20~23g. Resistant to TMV, Pto, For, F2. 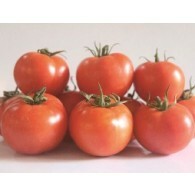 Red Mini plum-shaped ID Type tomato hybrid with average fruit size of 18~22g. Fruits are showing 9.5 in Brix level while showing high and continuous yield habit. Can be harvested 85 days after sowing during spring season. Resistant to TYLCV, TMV, F2. 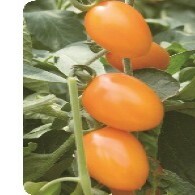 Yellow Mini plum-shaped ID Type tomato hybrid with average fruit size of 20~22g. Fruits have good storing and transportability. 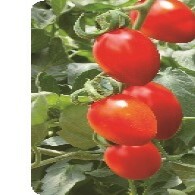 High in sugar content with good yield and resistant to TYLCV, TMV, Ph3, F2. 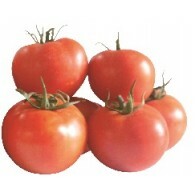 ID Type Red beef tomato hybrid with average fruit size of 300~350g suitable for greenhouse cultivation. Resistant to TMV, Ve, F0, F1 and Tolerant to TYLCV. Indeterminate tomato hybrid for fresh purposes. Average fruit weight of 250~300 gram. Fruit shape is Beef type with light green shoulder. Resistant to ToMV, N, F2. 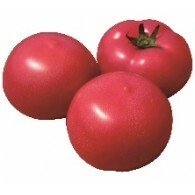 ID Type tomato hybrid for fresh purposes. Average fruit weight of 220~250 gram. Fruit shape is Beef type with light green shoulder. Resistant to Ve, TYLCV, TMV, F1, F2. 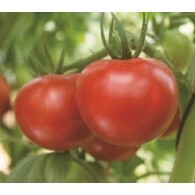 ID Type tomato hybrid for fresh purposes. Average fruit weight of 240~260 gram. Fruit shape is Beef type with light green shoulder. Resistant to Ve, TMV, For, F2. 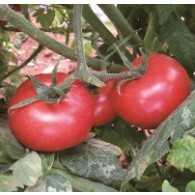 ID Type tomato hybrid for fresh purposes. Average fruit weight of 180~200 gram. Fruit shape is beef type with green shoulder. Resistant to Ve, TMV, F1, F2. Indeterminate tomato hybrid for fresh purposes. Average fruit weight of 160~180 gram. Fruit shape is beef type with green shoulder. Resistant to Ve, TMV, F1, F2. D Type hybrid for fresh purpose. Average fruit weight of 80~100 gram . Fruit shape is Square Round with no shoulder. Resistant to BW,VW. It can be harvested 55~60 days after transplanting. D Type tomato hybrid for fresh purposes. Average fruit weight of 180~190 gram. Fruit shape is round with light green shoulder. Resistant to Ve, TYLCV, TMV, For, F1, F2.